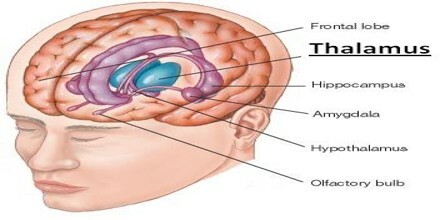 Thalamus is the part of the vertebrate brain that lies at the rear of the forebrain. It relays sensory information to the cerebral cortex and regulates the perception of touch, pain, and temperature. It works to correlate several important processes, including consciousness, sleep, and sensory interpretation. The human brain on average weighs about three pounds. 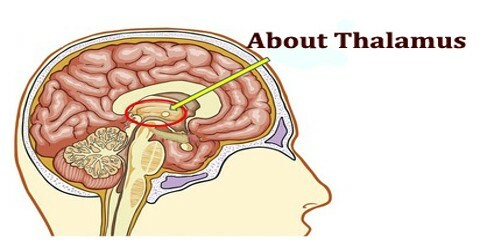 The top of the brain is divided into two hemispheres. The bottom of the brain is connected to the spinal cord by the brain stem. 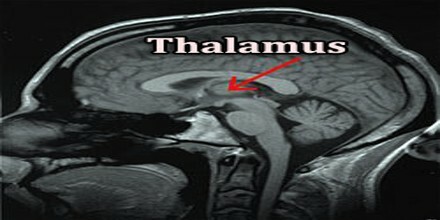 The thalamus is composed of two parts, often referred to as lobes. 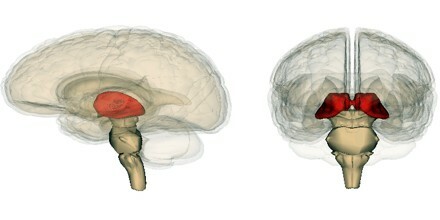 The thalamus surrounds the third ventricle. It is a subdivision of part of the brain called the diencephalon and is one of the largest structures derived from the diencephalon during embryonic development. It is a midline symmetrical structure of two halves, within the vertebrate brain, situated between the cerebral cortex and the midbrain. The medial surface of the two halves constitutes the upper lateral wall of the third ventricle. It is supplied with blood by four branches of the posterior cerebral artery, namely the polar artery, paramedian thalamic-subthalamic arteries, thalamogeniculate arteries and the posterior choroidal arteries. Within the thalamus lie myelinated nerve fibres called lamellae that separate the structure into individual parts. Distinct groups of neurons make up other parts such as the periventricular, the nucleus limitans and the intralaminar elements, which are collectively called the allothalamus. The allothalamus differs in structure form the major part of the thalamus called the isothalamus. The thalamus lies at the top of the brain stem near the centre of the brain from where nerve fibres project out towards the cerebral cortex. The thalamus is divided into two prominent bulb shaped masses of around 5.7 cm in length and positioned symmetrically on each side of the third ventricle. It is divided along the anterior to posterior axis (front to back) by a thin strip of myelinated fibers called the Internal Medullary Lamina (IML). At the anterior end, the Internal Medullary Lamina splits into two “branches.” The area in between those branches is called the Anterior nucleus. The thalamus derives its blood supply from a number of arteries: the polar artery (posterior communicating artery), paramedian thalamic-subthalamic arteries, inferolateral arteries, and posterior (medial and lateral) choroidal arteries. These are all branches of the posterior cerebral artery. It is part of a nuclear complex structured of four parts, the hypothalamus, epithalamus, prethalamus, and dorsal thalamus. The thalamus has nerve connections with the cerebral cortex and hippocampus. In addition, connections with the spinal cord allow the thalamus to receive sensory information from the peripheral nervous system and various regions of the body. This information is then sent to the appropriate area of the brain for processing. It sends visual information to the visual cortex of the occipital lobes and auditory signals are sent to the auditory cortex of the temporal lobes. The thalamic complex comprises the prethalamus, the mid-diencephalic organiser (MDO) and the dorsal thalamus (or just thalamus). The formation of the prethalamus and thalamus is induced and is thought to depend on the interaction between two transcription factors, Fez and Otx. In-between the expression domains of these transcription factors lies the MDO, which orchestrates the development of the thalamus by releasing the necessary cell signalling molecules required for its development. The development of the thalamus can be subdivided into three steps. The thalamus is the largest structure deriving from the embryonic diencephalon, the posterior part of the forebrain situated between the midbrain and the cerebrum. Damage to the thalamus may result in a number of problems related to sensory perception. Thalamic syndrome is condition that causes an individual to experience excessive pain or a loss of sensation in limbs. Damage to areas of the thalamus that are associated with visual sensory processing can cause visual field problems. Damage to the thalamus can also result in sleep disorders, memory problems, and auditory issues.